Celebrate the best in precision building design and delivery at the Offsite Construction Awards. 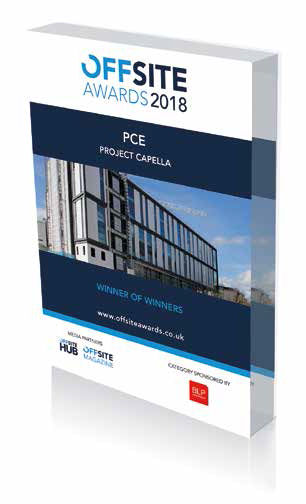 These Awards are organised by Radar Communications and reward outstanding examples of prefabrication and factory-based methods, products, systems and disciplines that increasingly strive to develop a sustainable, streamlined and cost-effective way to deliver a better built environment. Offsite manufacture removes much of the construction process from the construction site, leading to far-reaching and vital benefits. Across key sectors of UK construction, the Awards will showcase innovation, celebrate best practice and recognise overall expertise in offsite construction through landmark projects, influential people and material and manufacturing excellence in this dynamic arena. The stats so far - fifth year running, over 1500 delegates attended previous ceremonies, over 500 projects entered in 20 categories and approximately 120 companies taking home a gong.